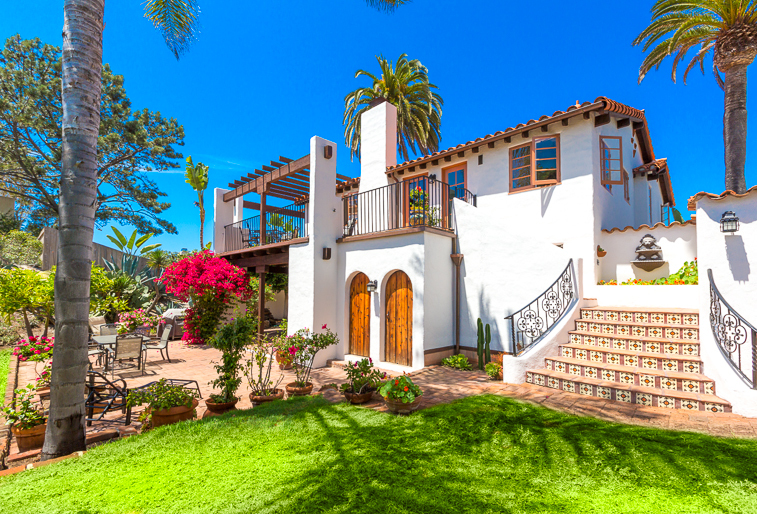 Spanish Villa home in Windansea has a 3,000 SF yard and Ocean Views! Living area is cozy and comfortable with flat screen TV and fireplace Sunny and cute kitchen has gas range and is fully equipped with all of your culinary needs Ocean view bedroom has a queen sized bed and french doors to the terrace Lots of windows for sunshine and shares bathroom with other bedroom French doors open out to the patio Enter into the yard from the gate off a private lane and be welcomed by this Mediterranean delight Second story terrace has plenty of seating and opens into kitchen, living room and bedroom to let the cool ocean breezes in. Classic Spanish style home features beam ceilings and hardwood flooring Convenient office and library in bedroom Charming dining room has seating for 4 guests Soothing decor and ocean breezes make this room a peaceful haven for sweet dreams Another bedroom also has a comfy queen bed and is decorated in peaceful ocean hues Bedroom has a full sized bed and closet space Jack and Jill bathroom has shower/tub and traditional Spanish tile with private doors to each of the bedrooms. 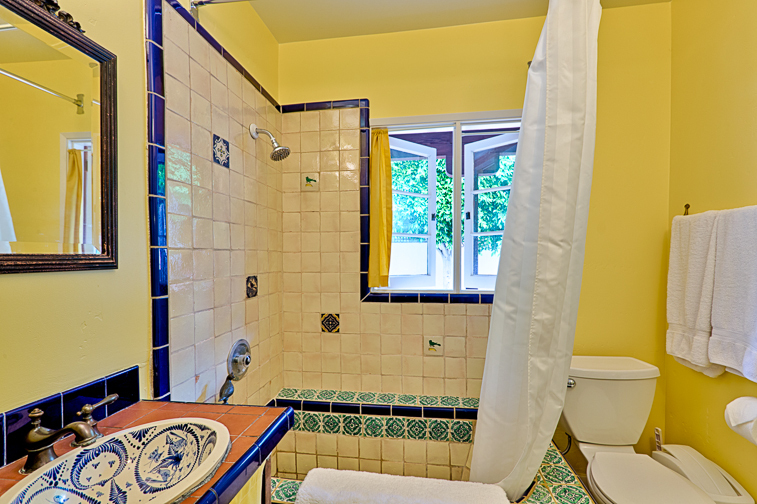 Bright tiles and sunny accents Spanish decor bath Beautiful Spanish tiled bathroom has soaking tub and shower Private Casitas has a living room with TV and kitchenette. Single futon can sleep an extra guest. 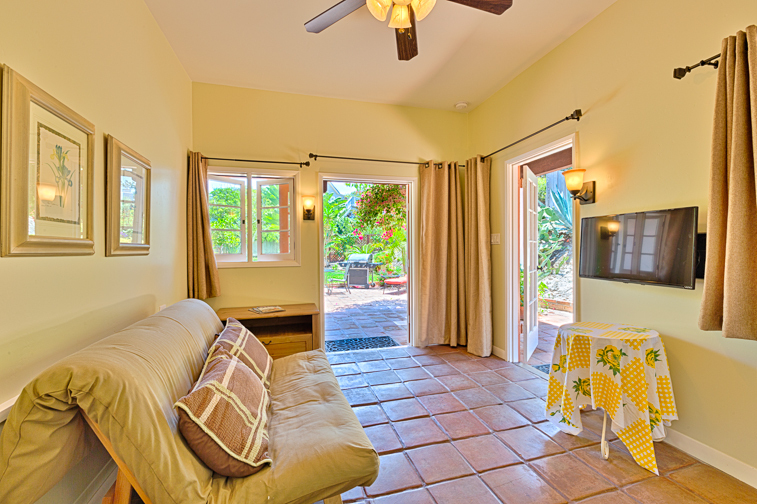 Ceiling fan and multiple doors open to welcome the ocean breezes Casitas has a sink, stove and refrigerator Two story home has 2 bedrooms on the second level and a private 1 bedroom Casitas on the main level Enjoy morning coffee while hearing the waves break at Windansea Beach. 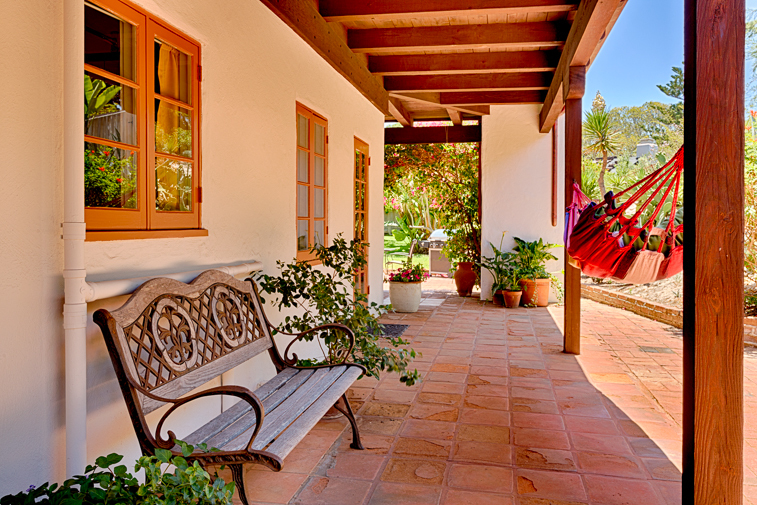 Enjoy an afternoon picnic or BBQ View of the lower patio and Casitas with private and tranquil hammock. 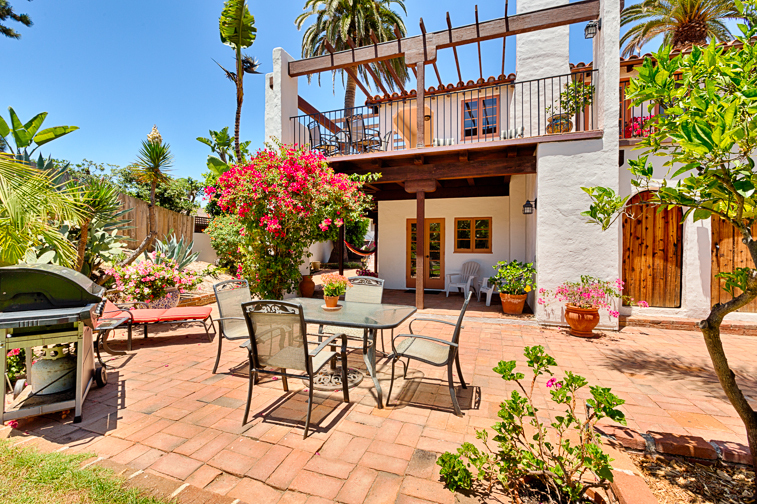 Side patio has entrance to the Casitas and stairs go up to the terrace level. 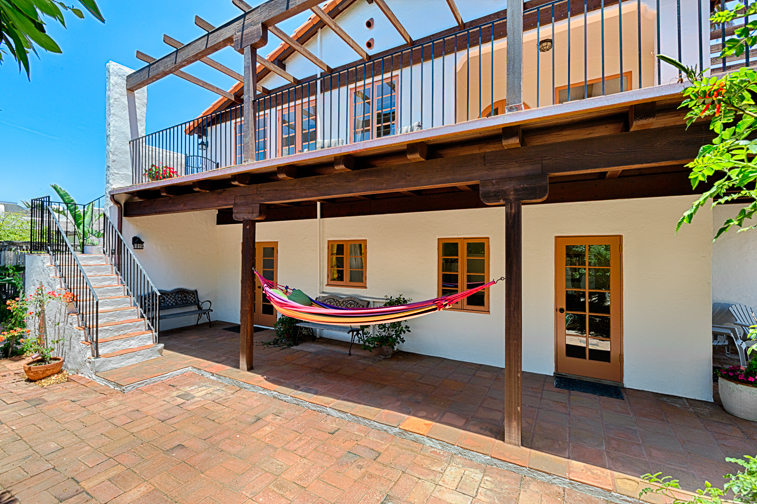 Home features expansive outdoor living with a ground level patio and wrap around second story terrace. Views of the yard are lush and green Perfect for a glass of Wine and sunset watching after a busy day! Sunny western side of the terrace faces the Ocean. 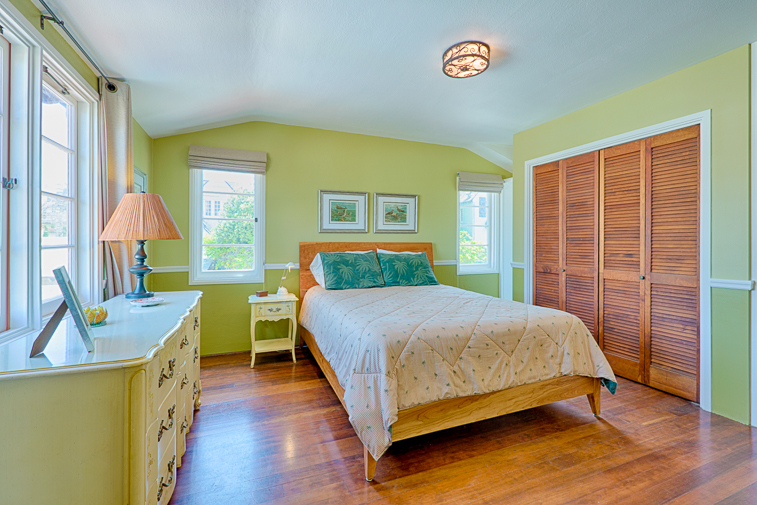 This is a gorgeous home with lots of class and history. 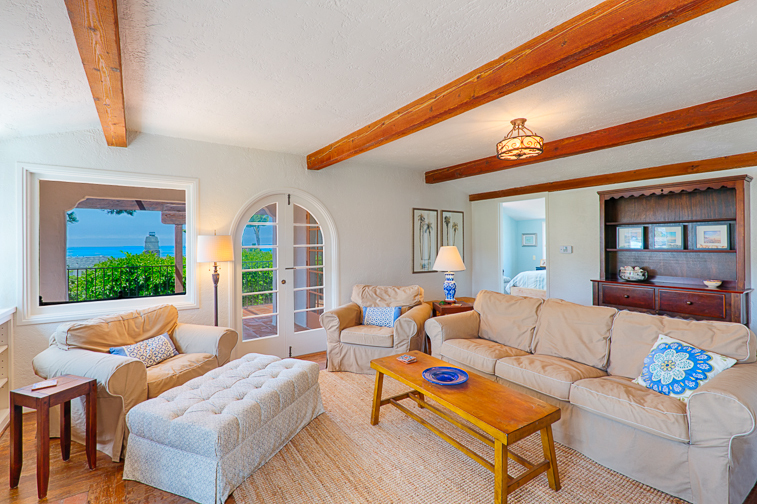 This historic home and sand Dune on the property added to the uniqueness of this home. 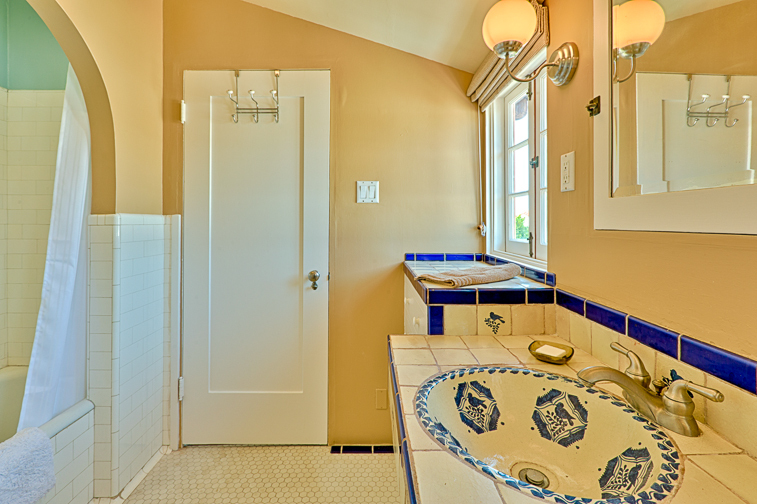 The owner has maintained the property with pride and joy that is evident throughout the home. 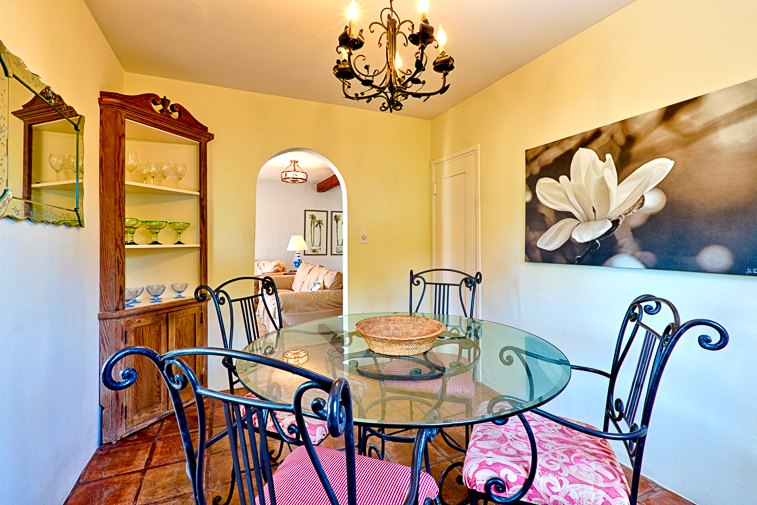 The home is perfect for couples to a family being close to the beach and local area. 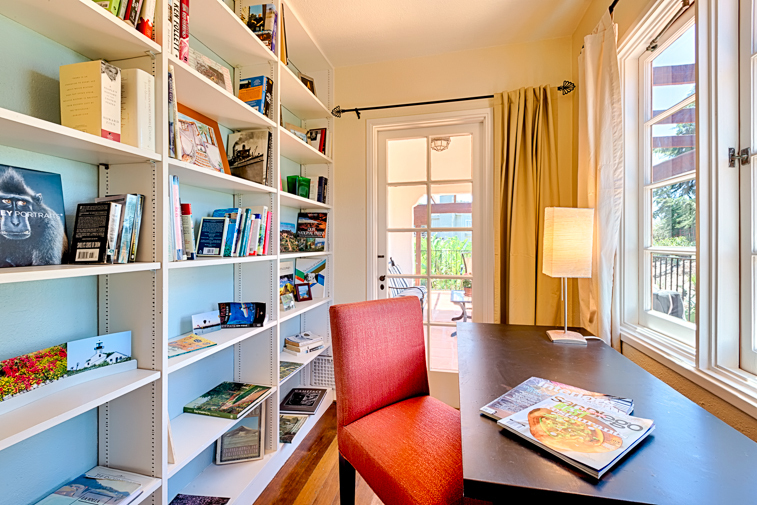 We highly recommend this home. 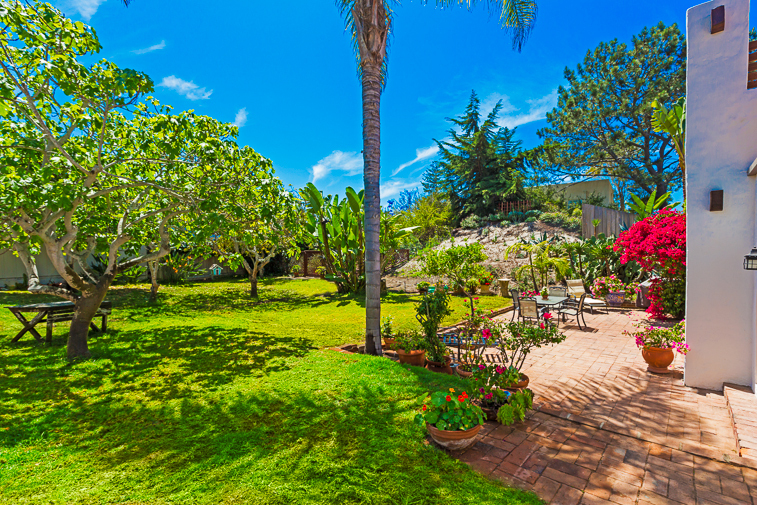 - Reviewed By Thomas C.
Beautiful home in a great location! Will definitely be back. 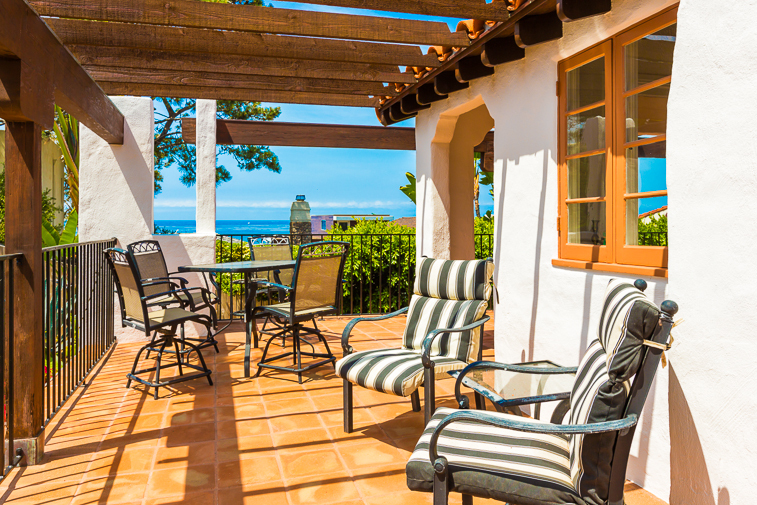 We returned to this family friendly and pet friendly two story hacienda in La Jolla for the second year and again enjoyed the lush lawn, gardens and portales overlooking the ocean at Wind and Sea beach. - Reviewed By Marilyn C.
This house is a true gem and is located in a quiet, beautiful residential area. A one minute stroll brings you to a quiet beach, daily sunsets can be enjoyed from the spacious terrace and the sound of the ocean makes the experience peaceful and relaxed. 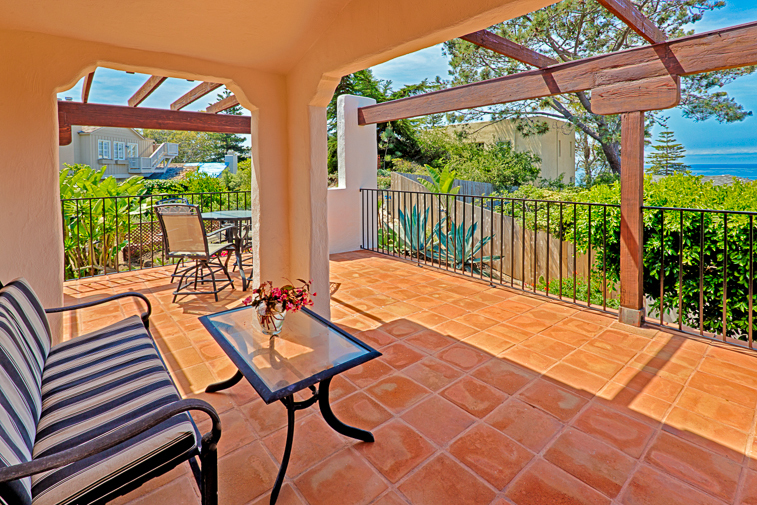 Although surrounded by other properties, you feel you have your own, spacious and private grounds with a large garden, lush trees and seating arrangements throughout the garden and on the terrace. The house itself is a very complete, with a comfortable and cozy living area, dining table area (table for four but outside there re dining areas for six and more), two bedrooms with comfortable beds (one with a small nook that served as my "office" with the sound of the ocean in the background), and downstairs is a separate area of the house with a bedroom, bathroom and pantry. A 10 minute walk (or 2 minute car drive) brings you to restaurants and shops among others a great Von's supermarket, El Pescador - an amazing fish market, and The Taco Stand - a must! 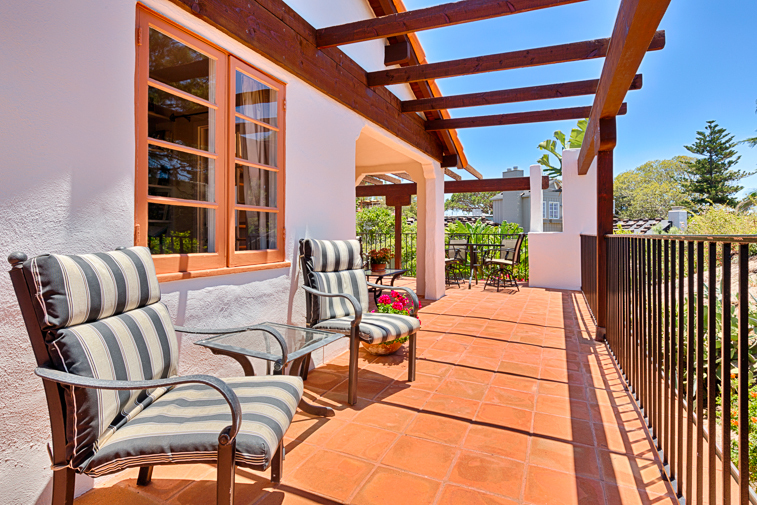 Other lovely areas to be explored are close by such as La Jolla Cove, Pacific Beach, etc. San Diego is 22 minutes away. The property mangement company was professional, hospitable and efficient. They offer an app that answers all questions prior, during and after your stay. We had a wonderful time and definitely recommend this property to others. This is an incredible house in an amazingly perfect location! 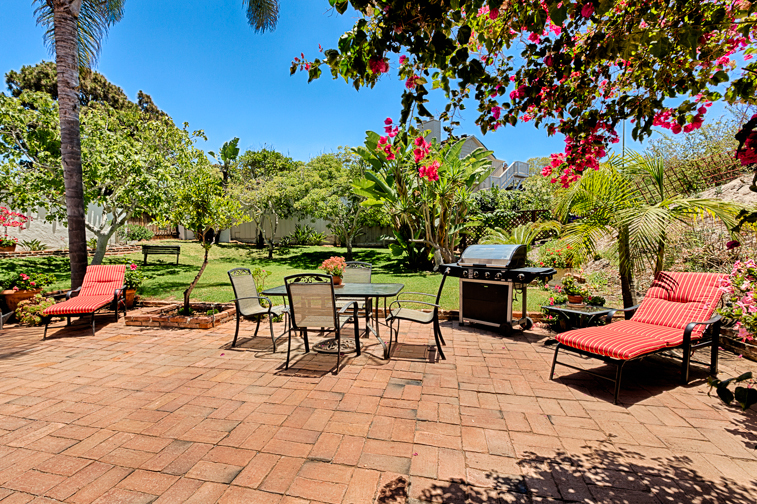 It has a wonderfully private feel, with an enclosed yard and garden (perfect for our son's dog, who loved exploring), a great patio with a gas grill and plenty of furniture, and ocean-view decking with comfortable chairs for sunset-watching. 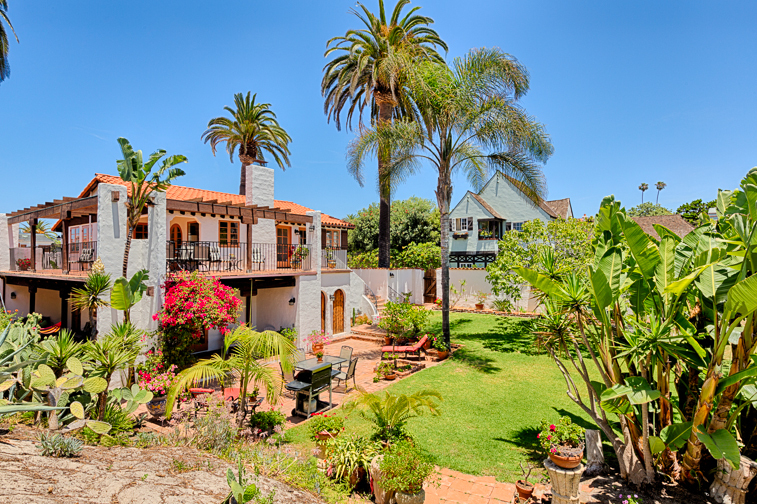 Best of all, it's walking-distance to a private neighborhood beach (just a block away). We were able to walk on the beach several times each day (the dog was a big fan! ); we even came across a huge seal sleeping on the rocks one evening. 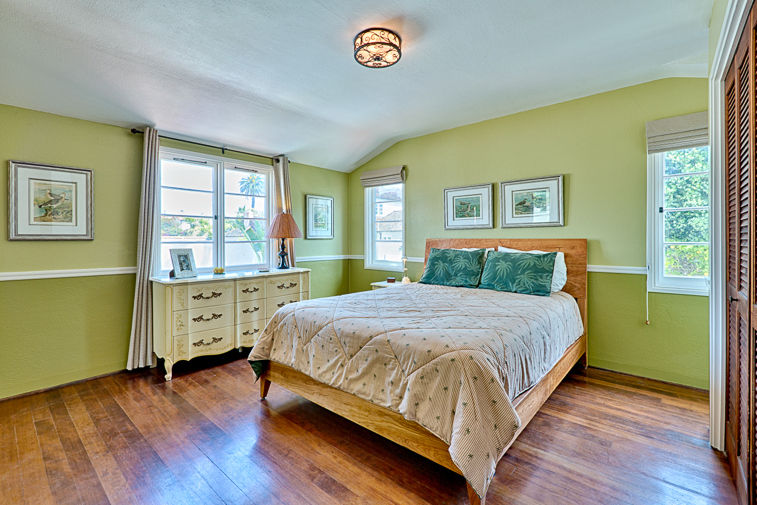 The house itself is very comfortable and well-furnished. 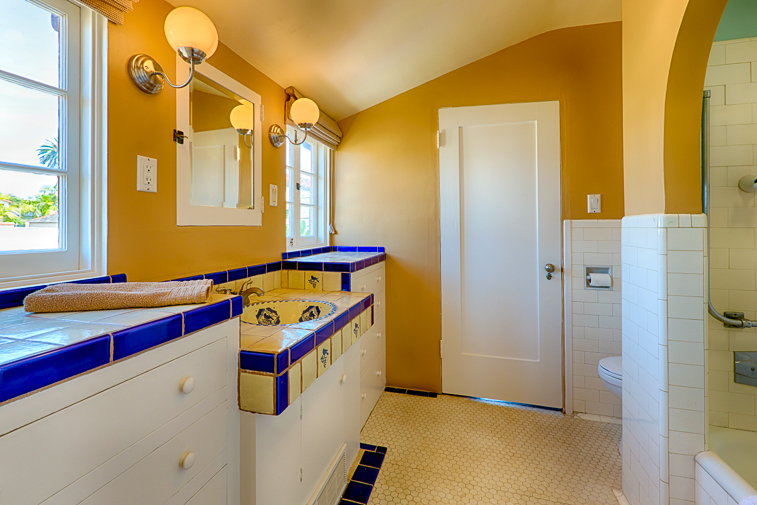 It's a Spanish-style house, with lovely touches (I especially liked all the tile-work in the kitchen and bathrooms). 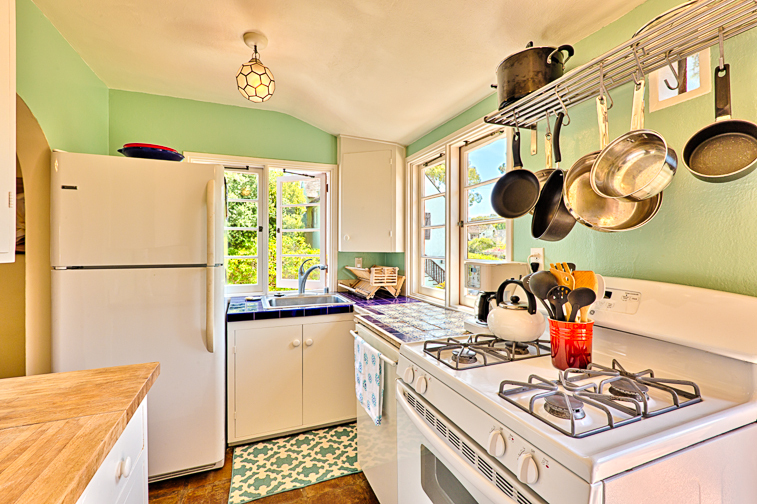 The main house has two bedrooms connected to a large Jack-and-Jill bathroom, a living room with working fireplace and wall-mounted flat-screen TV, a small dining area, and a cute kitchen with gas stove and plenty of dishes and cooking utensils. 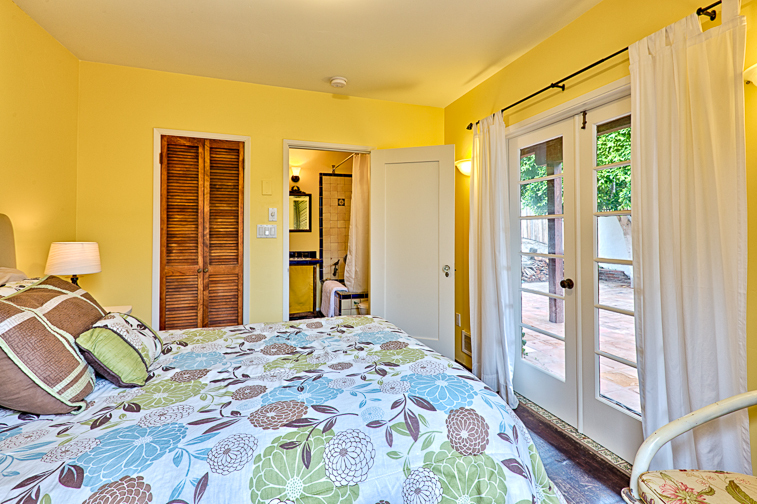 The third bedroom is located in the casita, a separate small house accessed from the lower patio. 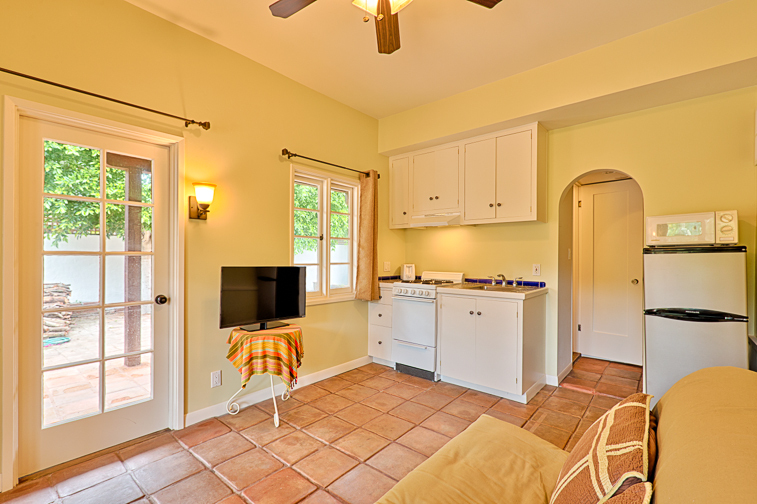 This was perfect for our adult son and his dog -- there's a comfortable bedroom and bath, a small living area with futon and TV, and a kitchenette with mini-fridge. 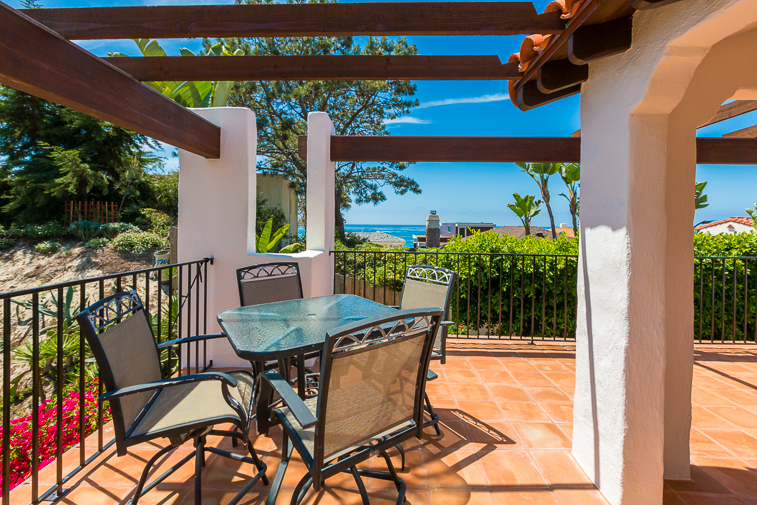 There's plenty of outdoor eating space, including a large dining table on the lower patio, and a smaller glass table on the upper deck with ocean views. We loved all of it! The weather wasn't all that great during our stay, so we didn't get the chance to enjoy the outside space as much as we would have liked. But we did build a fire in the fireplace, which made for a lovely evening. And we were able to eat two meals outside, even though it was a bit chilly! We had never been to La Jolla before, and we really enjoyed exploring the area. We hope to return next year, and we will definitely keep Paradise Found at the top of our list. 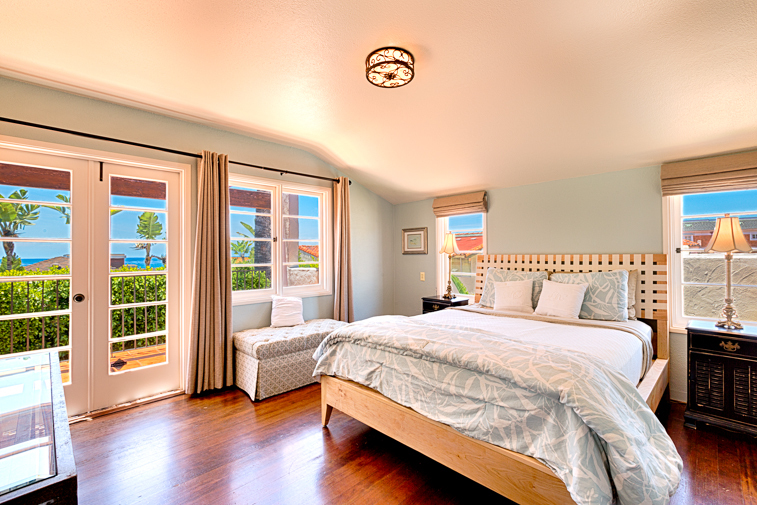 Seabreeze Vacation Rentals was great to deal with -- they were very responsive to questions, and check-in was very easy. No problems at all! We highly recommend Paradise Found. My wife and I rented this home and it was the perfect spot for us! 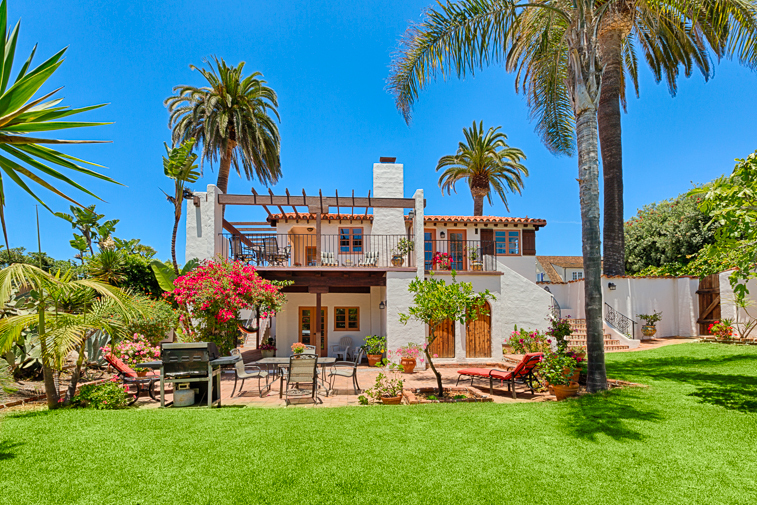 The house itself is beautiful, with ocean views, unique furniture pieces, and a great yard/patio. 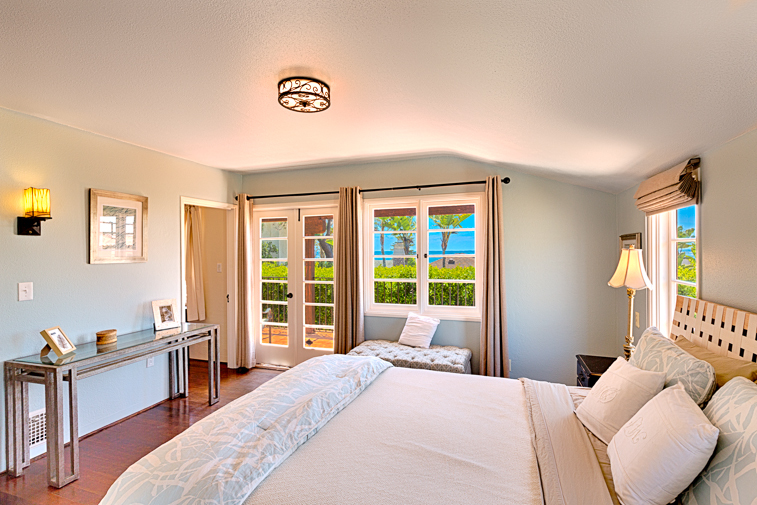 The beds were super comfortable, especially the one in the Master bedroom. We were able to fit all of our family members with ease! 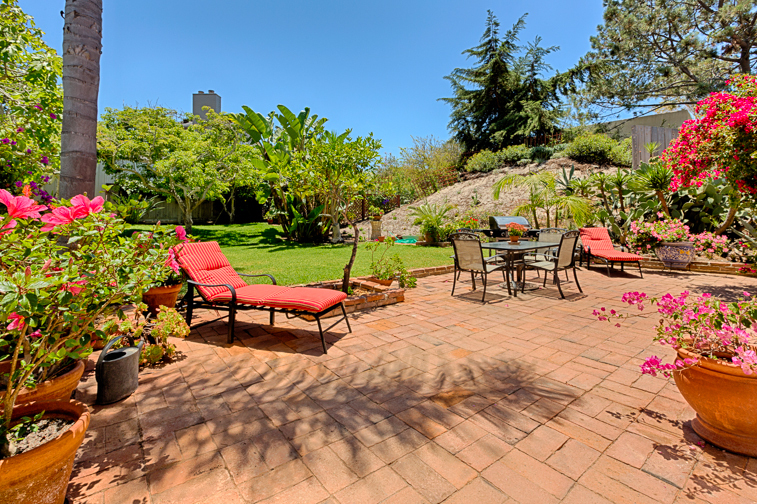 Home was beautiful, great layout and large yard; very private. We were very close to the beach in a nice and quiet neighborhood, which is great for families! The beds were all comfortable and outdoors felt like we were staying at a resort. 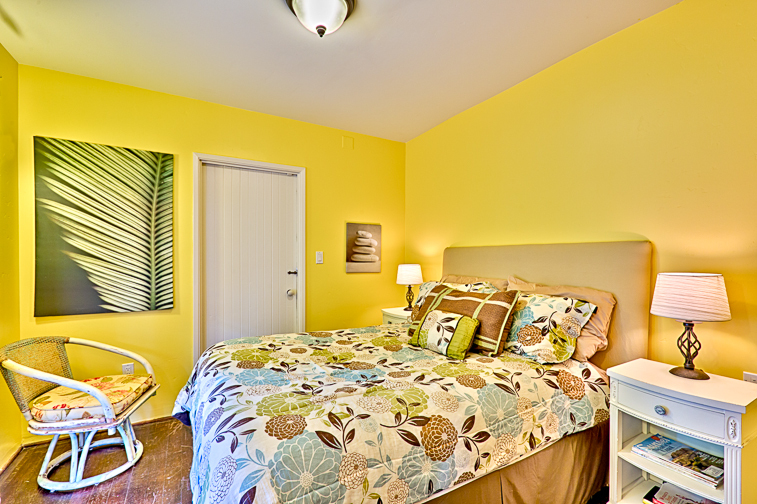 It was very easy working with SeaBreeze vacation rentals, we will certainly use them again on future vacations. 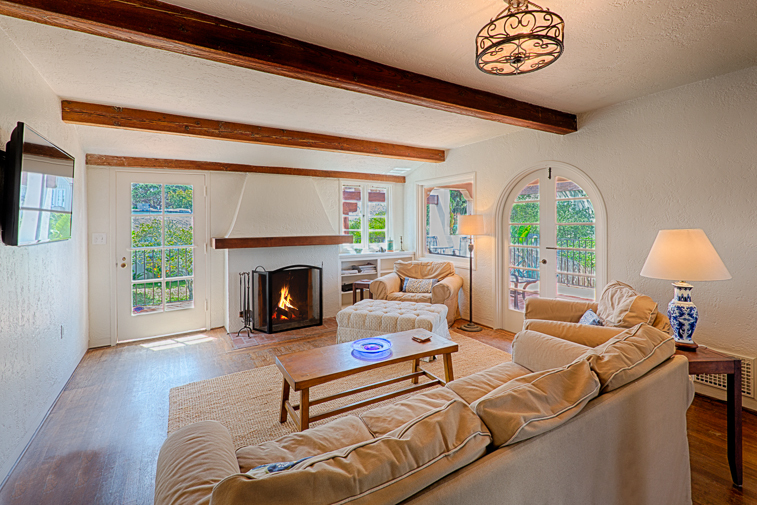 A wonderful home with ocean views and a short walk to the beach. 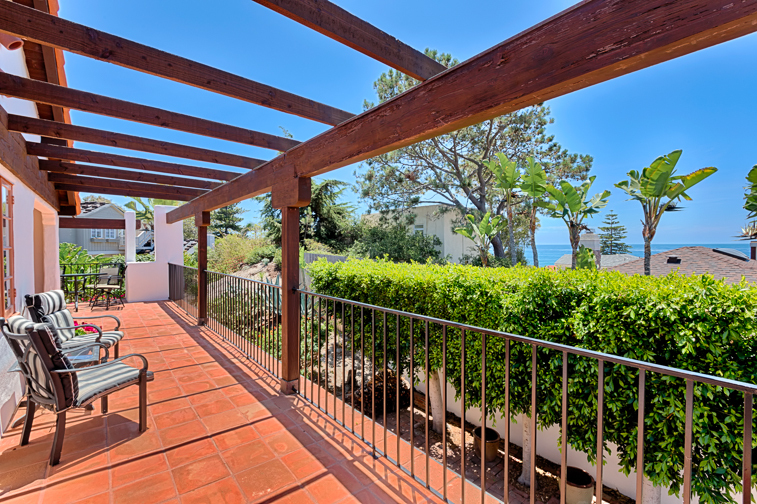 We loved the outdoor space - deck with ocean views and green space for kids playing and the barbecue. It was beyond our expectations. 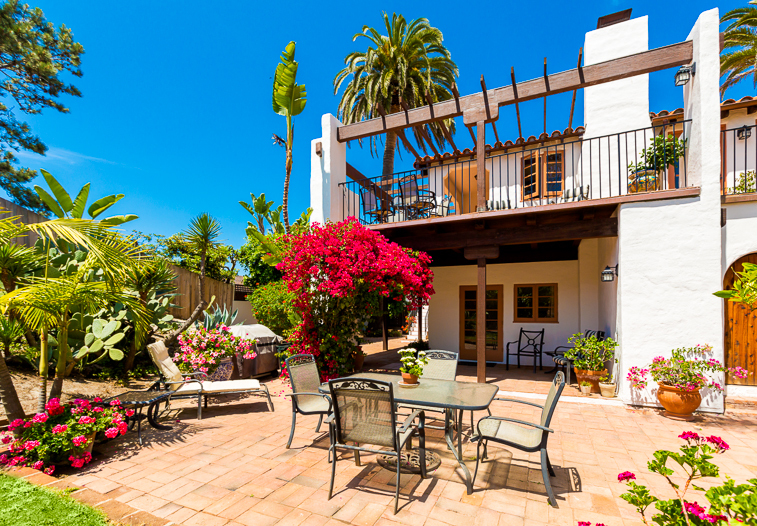 Beautiful architectural restoration, perfectly clean, lovely private setting with large enclosed landscaped yard and views of sunset/ocean from upper living level/wrap around terrace. Can sleep with all the windows open. Only wish lower level casita had screens to be more secure/worry about creatures at night. 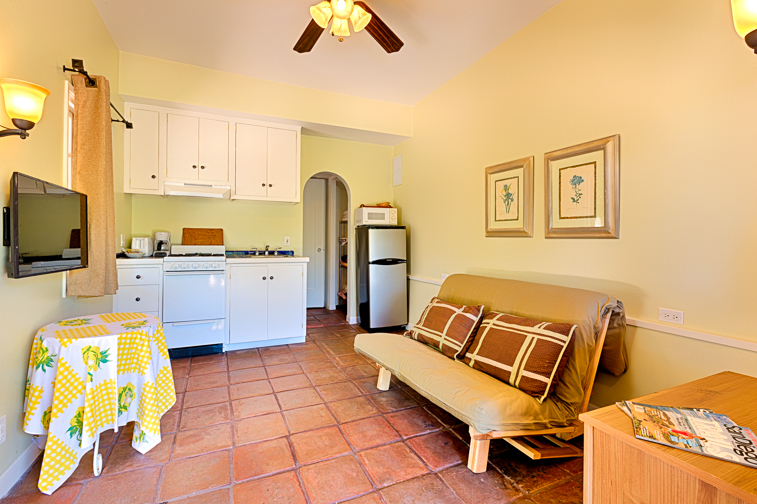 Small kitchen/dining but functional and quaint. Washer dryer hidden a bit under stair. Short 2 block walk to beach and town. Surrounded by equally lovely homes. Will come back for sure! Wow! This place exceeded my expectations! This places is even BETTER than in the photos. It's truly paradise. It's super close to the ocean and you can see, hear and feel the ocean all day. We slept with our doors open to get the breezes and hear the waves. It was awesome! 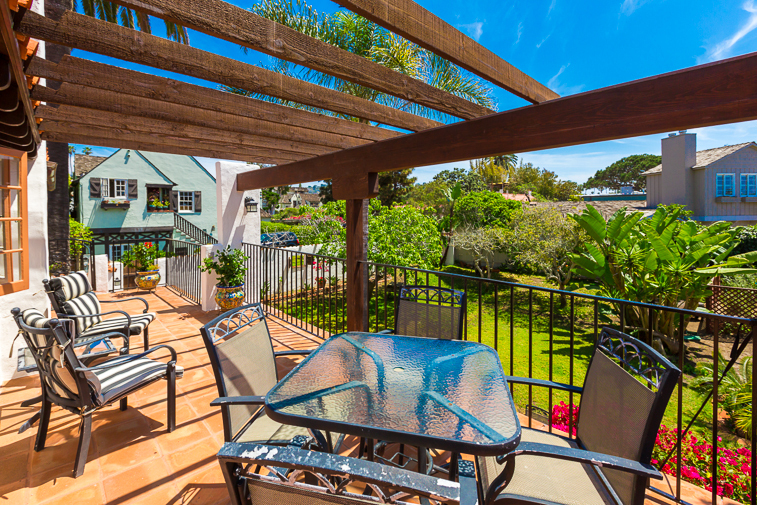 The yard is amazing, and the deck overlooking the beach is out of this world! I also had an opportunity to meet the owners who are the NICEST most accommodating hosts. I will be back! Grandma, teenager and parents LOVED this gorgeous Spanish! And our cockapoo. So funny we had no idea it was around the block from our rental last year. We will come back for sure. 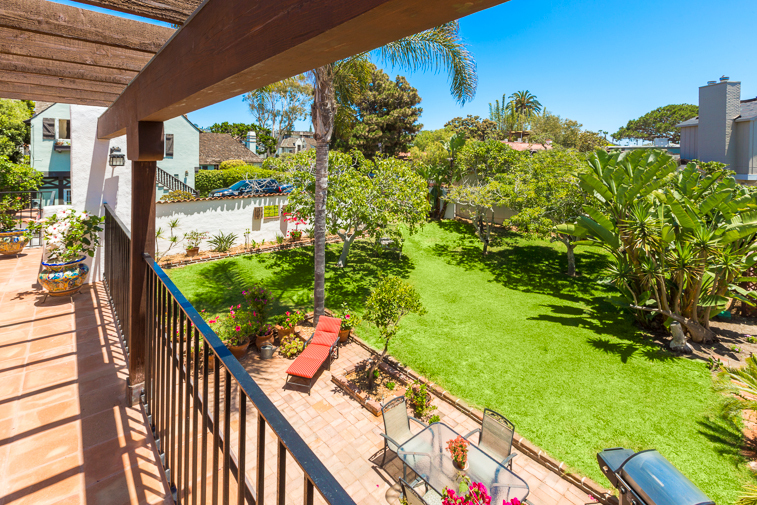 The yard, the views, the walk to beach + town and lovely historic neighborhood – perfect. Thank you. What a great vacation in this beautiful home. We had a lovely time. Kids loved the big yard, the hammock and the beach. The layout was perfect for us. Can't wait to visit again soon! We thoroughly enjoyed our week here in this lovely home. Beach days...relaxing in the yard - the whole family had a wonderful time. Thank You! Lovely place to be! Very nice here. We are loving it!